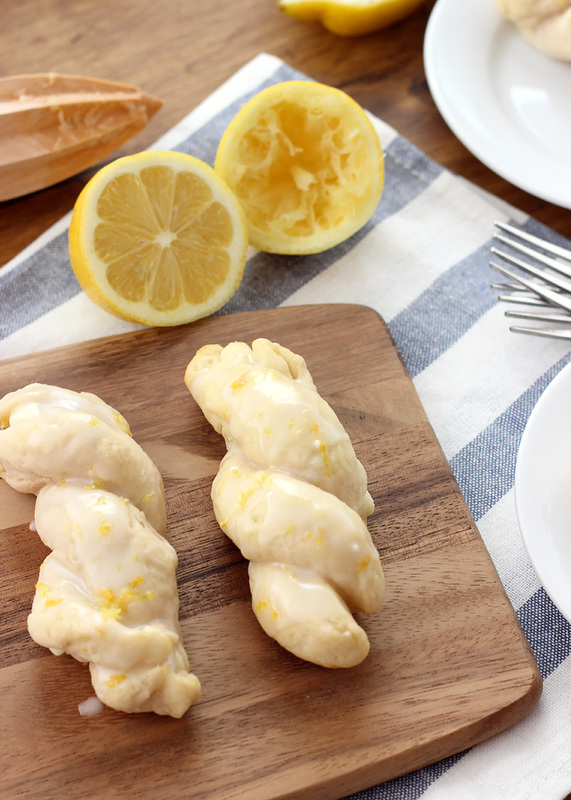 Sweet, buttery brioche twists studded with white chocolate and topped with a lemony glaze! In the bowl of a stand mixer fitted with a paddle attachment, combine flour, yeast, sugar, salt, and lemon zest. Add in milk, lemon juice, and eggs. On low, beat until dough starts to form, about 5 minutes. Add in butter pieces a few at a time, beating well after each addition. At this point you will need to switch out your paddle attachment for a dough hook. Knead dough until smooth, about 6-7 minutes. Add in white chocolate chips and knead until chips are distributed throughout. Transfer dough to a large bowl that is greased or sprayed with non-stick cooking spray. Cover with a clean towel and allow to rise in a warm place until dough is doubled in size. Preheat oven to 350°F. Line baking sheets with parchment paper or a baking mat. Turn dough out onto a lightly floured surface and gently punch down. Divide dough into 10 equal pieces. Divide each piece in half. Roll each piece out into an 8-inch long rope. Twist two pieces together and pinch the ends together. Repeat with remaining dough. Place twists onto prepared baking sheet. Allow dough to rest for 15 minutes. You can skip this step, but the twists will be slightly more dense and not as puffy. Bake for 15 minutes or until twists start to turn light golden brown. Remove to a wire rack to cool. Brush or spoon the glaze over the top of the twists. Sprinkle with lemon zest. Allow glaze to harden before serving. Recipe created by A Kitchen Addiction.